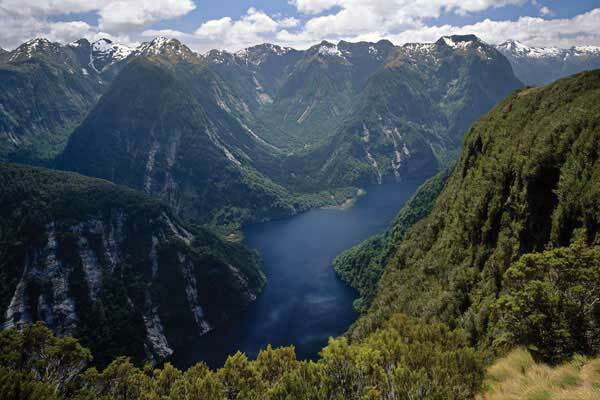 Equally stunning and more remote, Doubtful Sound is a nature lover’s dream destination. Rare Fiordland Crested Penguins, New Zealand Fur Seals and playful Bottlenose and Dusky Dolphins can be spotted here. The richness and diversity of the scenery will leave you speechless. Here, away from it all, you can experience the “Sound of Silence”. It is within this fiord that we can offer you extended kayaking trips which take you further than anyone else, scenic helicopter flights and nearby glacier landings. You will return from a day at Doubtful Sound with memories that will last a lifetime. You can also choose one of our scenic helicopter flights that combines Doubtful Sound with some of the lesser known Sounds such as Nancy, Caswell and George.